Alfonso Texidor and Linda Wilson in the Sun Rise Cafe, the opening day of Lopez and de Losa’s exhibit. Local award-winning artists and Salvadoran food will come together this Thursday, July 23 at the Sun Rise Restaurant on 24th Street to support El Tecolote, the Mission District’s oldest bilingual newspaper. “It’s important that community papers like El Tecolote be around,” said Amanda Lopez, a photographer and one of the featured artists, in an email interview. 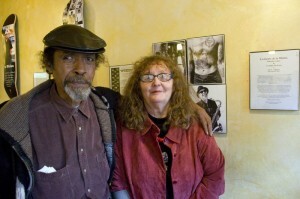 Alfonso Texidor and Linda Wilson in the Sun Rise Cafe, the opening day of Lopez and de Losa's exhibit. 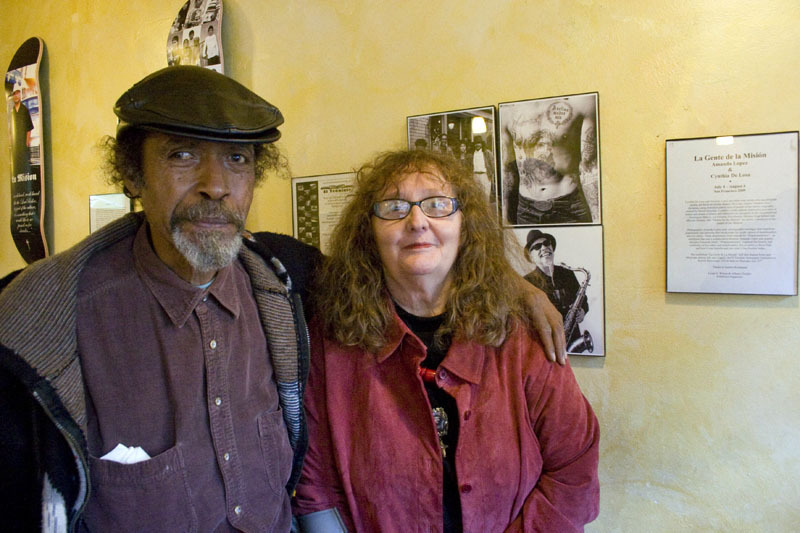 She and other artists, poets and musicians will gather for the benefit and art exhibit for El Tecolote, which has been publishing for 39 years. The exhibit will feature Cindy de Losa’s “shadowboxes” that recreate Mission scenes using Homey vending machine dolls and a series of skateboard decks designed by Lopez and graphic designer Fernando Marti. The decks, from a project called “Desplazamientos” incorporate both Lopez’s own photography and images from El Tecolote’s photo archives. “Desplazamientos” focuses on the area now known as the Potrero del Sol skate park at Potrero and Cesar Chavez streets. “Through our research we discovered that the park was once a local low rider meet up and hang out,” said Lopez. The decks’ artwork celebrates that low rider culture, incorporating portraits of figures such as Mallory Tulier, who used to run a women’s low-rider club. At the exhibit, the decks will sell for $100, while de Losa’s shadowboxes will go for $200. Eva Martinez, executive director of Accion Latina, the nonprofit umbrella that manages El Tecolote, says that revenues from the fundraiser, which is being organized by Alfonso Texidor and Martha Duenas of Accion Latina, will go to general operating expenses of the biweekly paper. Funding a new computer for the office is high on the priority list. El Tecolote also has a Facebook causes page to help gather support. Martinez is optimistic about the fundraiser, however, which will feature national award-winning poet Lorna Dee Cervantes as well as several others, plus music from Francisco Ferrer, Ernesto Jimenez and El Gran Omar. “When we put out a call for help … they come out of the woodwork,” she said, referring to both the artists and the community. “We’ve held to the principles we started with,” Martinez, who been involved with El Tecolote since the 1970s, said while talking about the community’s support. Along with its bilingual content, the publication also refuses to run advertisements from alcohol or tobacco manufacturers, the military, or certain corporations. NextShowdown! Supervisors V Budget LIVE.